Emile Antoine Verpilleux (1888-1964) was a British-born artist of Belgian and Scottish descent whose virtuosity in a number of artistic mediums - including landscape painting, portraiture, illustrations, and, perhaps most notably, colored woodcut printmaking - earned him considerable recognition and acclamation in the first half of the twentieth century. He holds the distinction of being the first artist to have had a colored woodcut print hung in London’s Royal Academy of Arts. Verpilleux was born in the Notting Hill district of London on March 3, 1888, to a Belgian father (though some biographical sources list him as French) and a Scottish mother. His father was a professor of languages who died when Verpilleux was three years old. With the exception of two years of schooling in France beginning when he was ten, Verpilleux was brought up entirely in England, commencing his education in art with a brief period of study at the Regent Street Polytechnic School. In 1906, at the age of eighteen, he departed for the Academie des Beaux Arts in Antwerp, Belgium, one of the oldest (founded in 1663) and most prestigious art academies in Europe. Once there, he embarked on a program of study in painting, enrolling in such prerequisite courses as drawing and design, and may never have entered the world of printmaking but for a chance encounter with an unnamed Canadian artist (possibly Hubert Valentine Fanshaw, according to the printmaking website The Linosaurus), who suggested that Verpilleux’s talents might be eminently compatible with the wood-engraving and wood-cutting (or technical) side of the Academy, led by director/professor Edward Pellens (1872-1947), one of the leading wood-engravers of early twentieth century Europe; Verpilleux, persuaded by this artist whom he believed “knew the ropes,” elected to make the switch, and at the conclusion of two years on this track, had made such remarkable progress that the Academy’s authorities purchased a number of his prints and drawings for the museum attached to the school, and subsequently awarded him with what today would be considered a “full-scholarship” for the balance of his matriculation. Verpilleux’s earliest notable prints, before he began experimenting with what was to result in his much-heralded color-generated atmospheric effects, were in black and white, such as An Old Man With A Pipe and Old Man’s Head, the latter not only revealing his gift for portraiture, which would serve him so well later in life, but also proving that he belonged to a very select group of artists who could skillfully capture a portrait in a woodcut print. In 1914, in the wake of the outset of World War I, Verpilleux enlisted in the Royal Flying Corps (the precursor to the Royal Air Force), eventually attaining the rank of Captain. He served as a pilot flying aerial reconnaissance missions over France, and reportedly was shot down at least twice, spending time at war’s end in Bristol Hospital. During the war he managed to paint numerous battle scenes, many featuring aerial combat. Following the conclusion of hostilities he was commissioned to paint a series of oils depicting scenes of the Great War; today many of these paintings are in the collection of the Royal Air Force Museum in London. All told, he served for eight years, from 1914-1922. In recognition of his “outstanding service,” he was appointed a Member of the Order of the British Empire (MBE) during the New Year Honours ceremony on January 1,1919. Several more of Verpilleux’s early prints, featuring representations of famous European architectural landmarks and naturalistic settings, were displayed in a 1923 exhibition at the Ipswich Fine Art Club, including British Museum; Malines; and The River, from Waterloo Bridge, with The River being assessed thusly in the January 3, 2012 posting of The Linosaurus: “Verpilleux’s view of the River Thames is a remarkable achievement in many ways. It’s accurate. It’s panoramic, has great colors toward a setting sun. And it’s without any equivalent. . . . Would it have been a painting and more known it would have been discussed and analyzed by art experts all over the world. It would have been hung in a prominent museum in a prominent spot. But it’s not. . . . Not even in London.” Both the British Museum and Malines prints further reveal underappreciated aspects to Verpilleux’s work: his power of observation and knowledge of history, displayed through the use of the black keyblock in the foreground of the prints. The February 7, 2012 edition of Modern Printmakers offers this about the British Museum print: “It’s only after you take a closer look that you pick out the Edwardian details. Which is a shame. He is too well known for his effects and not well-known enough for his observation. And observant he was. For these are real Londoners . . . busy and blase, paying no attention to their aloof surrounding monuments, preoccupied with culture, travel, getting home, the shops. Occasionally, an umbrella is used to indicate some point of interest, but the people rarely engage with their surroundings and in general are too insouciant and elegant to bother.” Of the Malines print (showing the majestic tower of St. Rombout's Cathedral in Malines [Mechelen], Belgium), the February 10, 2012 update on Verpilleux inThe Linosaurus reflects upon the image in the foreground: “A procession seems to be going on . . . since 1273 the famous Hanswijk Procession devoted to Maria is held here every Sunday before Ascension for over 800 years. Followed by a horse-drawn parade with historical themes and relics of St. Rombout. Although very small the horses and horsemen are clearly visible. Well, well, Emile Verpilleux, the teacher, hidden history lessons from a woodblock print.” (This fascination with history on the part of Verpilleux will be seen to play a role later on in his work executed in Bermuda.) The decade of the 1920s also marked a shift in the nature and subject-matter of Verpilleux’s prints. As the previously cited February 7, 2012 edition of Modern Printmakers explains: “In his 1920s prints like Winter Evening, he adopts another mannerism. And this time it is light and color, and light and color often of the most sensational kind.” Two other prints spotlighting Verpilleux’s ability to produce dramatic color effects are 1924‘s The Last Furrow and now winter comes slowly, whereby Verpilleux permeates the sky with an aura of color rarely evidenced in other woodcut prints. Additionally, Verpilleux reoriented his center of attention during this period to urban cityscapes, an apt subject for the strong linear shapes that woodcuts often yielded. Prints produced in New York City (or derived from photographs, as was increasingly the case in this era across the artistic spectrum) such as The Woolworth Building from City Hall and The Chanin Building are indicative of Verpilleux’s transition, in which the principal subject of his image was shown in silhouette, backlit by striking colors which would diffuse across the background of the image. In 1927, Verpilleux was selected for inclusion in the multi-volume series,Masters of the Colour Print, an honor accorded to the eight printmakers whom the editor (Malcolm Salaman) believed represented printmaking in its finest forms. Also that year the future President of the United States, Franklin Delano Roosevelt, commissioned Verpilleux to paint a portrait of his wife, Eleanor, America’s future First Lady. Verpilleux’s diversity of talent also generated work as an illustrator of books and magazines, with his services being rendered for such literary luminaries as Sir Arthur Conan Doyle, George Bernard Shaw, H.G. Wells, and Agatha Christie. But despite his many accolades and successes - including exhibitions at the Royal Academy, the Royal Society of British Artists, the New English Art Club, the Royal Scottish Academy, and the Kennedy Galleries on Fifth Avenue in New York City - Verpilleux was apparently dissatisfied with the trajectory of his London-based career, and in 1931, he took the first of many visits to the island of Bermuda, to which he moved permanently in 1937, and where he eventually evolved into a leading artistic force and community stalwart. Verpilleux’s initial stay in Bermuda was intended to be a three-week holiday, but, evidently finding the surroundings conducive to his work, he ended up staying for 18 months, first as a guest of his friend Governor Cubitt at Government House, and later renting “Pegem House” in Somerset (The Bermudian, April 1932 p.26, and August 1932 p.26). 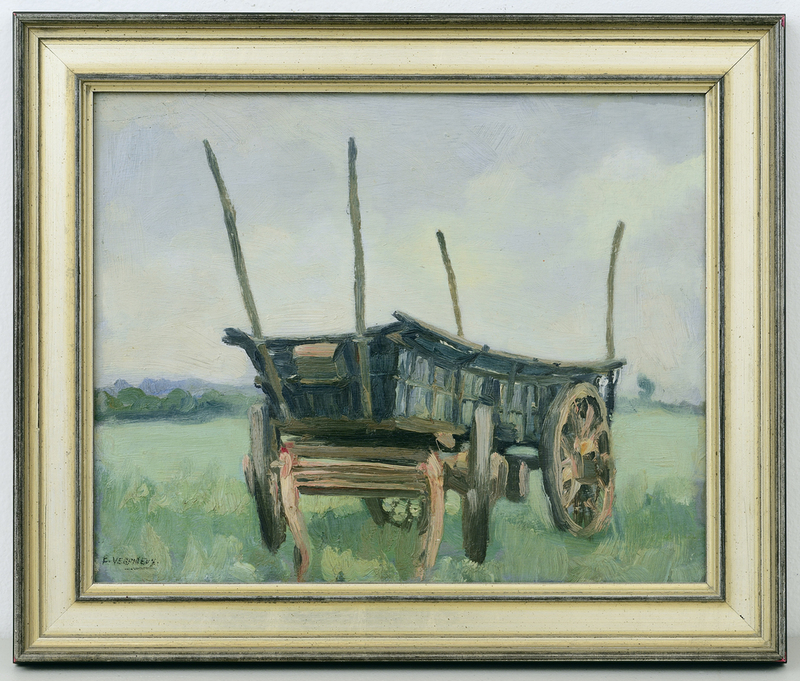 He is known to have exhibited his work - now moving in the direction of landscape paintings and portraits - in the 1933 Art Association Show, and by the following year’s show, he was already regarded as one of the island’s most accomplished artists, with the reviewer K.B. Hudson observing in the June 1934 issue of The Bermudian that “his works were notably superior to almost all the other exhibitors at the 1934 Art Association Show.” In 1936 Verpilleux wed for the second time, marrying American artist Carolyn Putnam (who had been a frequent visitor to the island prior to their marriage), with the couple taking up residence in 1938 at “Buckingham,” Southampton, and moving permanently the following year to ”Cheriton,” Spanish Point (Royal Gazette, March 14th 1938 pp. 11 and 12, and November 15th 1938 p.1). By the spring of 1938, Verpilleux had already painted over 150 portraits on the island, publicly making note of the fact that he found himself more productive in Bermuda than elsewhere (perhaps the climate aided his chronic bout with asthma). That same year he held a solo exhibition of his portraits at the Oxford Book Store Gallery (ibid, March 28th 1938 p.2 and April 5th 1938 p.2). In 1939 Verpilleux judged the first annual art exhibition of the St. David’s School for American children, in Paget (ibid, May 27th 1939 p.11). At the 1941 United Arts Festival Exhibition at the Hamilton Armory (a major cultural event held to raise funds for the Royal Air Force Benevolent Fund), Verpilleux’s 100-foot frieze of Bermuda Scenes, commissioned for the Grosse Point, Michigan, home of Bermuda sojourner Wendell Anderson, was a major feature (The Bermudian, November 1941 p.12 and April 1942 p.27), and was later donated by the Anderson family to the town of St. George’s, where it continues to be displayed in the Town Hall. Ever the patriot, Verpilleux volunteered his services to the war-effort in 1943, leading to the decision on the part of British Intelligence to employ him (in the guise of a Lieutenant-Commander of the Royal Navy Volunteer Reserve) to instruct Free French sailors in anti-submarine warfare (Royal Gazette, September 21st 1964 p.13). In 1946, at the opening of the new Art Shop and Gallery at A.S. Cooper & Sons' department-store in Hamilton, he exhibited numerous Bermudian and English landscapes, with the English scenes comprising mainly countryside views (ibid, March 18th 1946 p.2). In April of that year he displayed portraits at the Art Association’s big ‘Art Week’ exhibition at the former Hamilton Hotel, with his work being warmly praised in the April 11th 1946 (p.3) edition of the Royal Gazette; around the same time he restored two royal portraits (King George V and Queen Mary) for the colonial government (ibid, April 27th 1946 p.2). Also that year Verpilleux produced what is perhaps the best known oil painting from his time in Bermuda: an aerial view of the island titled Bermuda, which was unveiled for public viewing at the Art Association in August, 1946 (ibid, August 10th 1946 p.2), and which now hangs over the grand staircase leading to the art galleries at City Hall, Hamilton. (This was not Verpilleux’s first aerial artwork: he had painted a view of the Somme battlefield in France in 1916, for use in connection with the observation service of the Allied artillery forces engaged there.) Other works executed in 1946 include a handsome panoramic view from Spanish Point looking over the islands of the Great Sound, and several paintings (including Dawn and Cactus) which were part of a group show that year at the Art Association Galleries (ibid, November 16th, 1946 p.14). In 1949/1950, Verpilleux collaborated intensively with the Polish potter, clay-modeller and former soldier Andre Bohomolec to produce the elaborate historical dioramas that were purchased by the Trade Development Board in 1952 for display at Fort St. Catherine (ibid, March 9th 1952 p.12). Verpilleux’s firmly established local reputation grew even more in the 1950s: in 1952 he co-founded (and became President of) the Society of Artists in Bermuda (ibid, May 1st 1952 p.1), a body of mostly-professional artists which merged with the Art Association in 1956 to become the Bermuda Society of Arts. During this period he was prominently featured in The Bermudian magazine, including a major profile by Nancy Lou Lyons in the November 1953 issue (he was also profiled in the June 25th 1961 edition of the Royal Gazette), and an article he himself wrote (“Bermuda - A Challenge to the Artist”) for the February 1951 issue. Some of his more notable paintings from this later period include 1947’s Early Morn at Bosses Cove (exhibited at the Art Association); Tranquil Moorings, Bermuda (1948); Light and Shade on a Bermudian Chimney and The Aftermath (c.1950; both illustrated in his February 1951 article in The Bermudian); The Hay Wagon (1950; a bold Impressionist effort highlighted by prominent brush strokes and strong coloration, especially an intense green in the foreground); A Passing Phase (c.1951, praised in the August 24th 1952 edition of the Royal Gazette); and Wind, Sunlight, and Shadow, which was included in the 1959 Society of Arts’ Bermuda: Past, Present, and Future exhibition, along with the aerial effortBermuda from 1946 (ibid, July 25th 1959 p.5). Verpilleux’s own retrospective exhibition of Three Decades of Bermuda Portraits was held at the Society of Arts in 1961, featuring over a hundred of his Bermuda portraits (ibid, June 25th 1961 p.1). Emile Verpilleux died in Bermuda on September 10, 1964, at the age of 76. A posthumous exhibition, including several landscapes and book-illustrations, was held at the Society of Arts in 1975 (ibid, November 24th 1975 p.18 and November 25 1975 p.7). Over the years examples of his work were purchased by the British Museum and the V & A (Victoria and Albert) Museum for their permanent collections. Though late in life Verpilleux spent part of each year in Jamaica as a response to his chronic respiratory ailments, he continued to reside principally in Bermuda, whose multi-hued waters he had called “sheer joy” in 1949. Perhaps it was this “sheer joy” that helped him to become, in his mature years, a much sought-after and acclaimed portraitist, as well as the creator of many masterful landscape paintings. But, in the final analysis, it is his color woodcut prints that will most likely occupy center stage in future retrospectives, reinforcing what has finally and belatedly come to be held as a consensual opinion: that Emile Antoine Verpilleux was one of the finest color woodcut artists working in Britain during the first half of the twentieth century. Written August 2016 by Brian Flon, author of "Hell's Kitchen Requiem" (2014), available as an e-book at Amazon, ITunes, and Barnes & Noble.